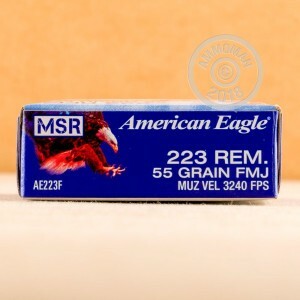 Grab a case of this Federal American Eagle 223 for your next trip to the range. Each round is brass case, boxer primed and reloadable. These rounds are tipped with Federal 55 grain FMJ bullets, which have been a range training staple for decades. 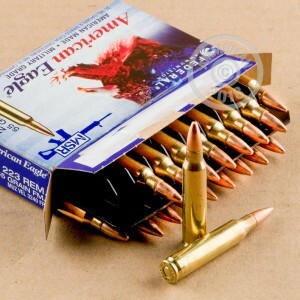 For the range you can't beat this ammo or Ammoman for the price, shipping speed & reliability. The ammo is priced very well. The shipping was very fast. I have shot 300 or so rounds no problems with great groups, and I have already recommended this ammo to several friends. Great Job ammo man!! Will be ordering from ammoman again! No FTF's or ejection issues with this ammo thru my Smith & Wesson M & P Sport 15....quality ammo I would certainly buy again. This was my first time purchasing from ammoman, but I wasn't displeased. 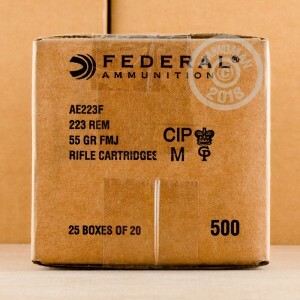 The ammo showed up in a timely manner, the shipping information was updated quickly and I was able ensure I had someone home to receive the package when it arrived. I have yet to actually fire any rounds as my local range hasn't yet thawed out, but based on preliminary inspection, the rounds appear to be fine. Will definitely be shopping here again in the future. I fired several rounds. No problems. The rest is vacuum sealed. Great product; good price; shot well; would buy again. Only shot 120 rounds out of 500 but seems good no jams all rounds fired and ejected,was shooting in a about 20 mile an hour wind at 100 yards,within 1 inch of my target,awesome shipping received the next day. across town instead of another state. Thanks again. accurate ammo at a great price! I shot several rounds without a hiccup.